Listening to Pain Management can help you reduce pain signals until they no longer seem significant. You will also learn an effective, time-proven method to diminish pain signals anywhere. Use Pain Management to help restore the vitality and dynamic energy needed for the perfect functioning of both mind and body. 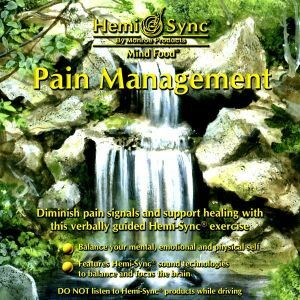 This remarkable Hemi-Sync® exercise helps you balance and equalize your mental, emotional, and physical self and guides you gently into a deeply, restorative sleep. Pain management, General health, Cancer.